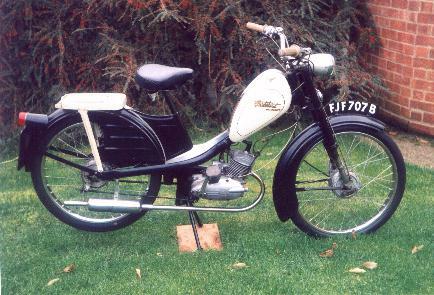 Phillips Cycles Ltd of Smethwick, Birmingham decided to introduce their first Gadabout model P39, fitted with a 2-gear Rex engine, in November 1955 at the Earls Court Show. This wasn't to work out as particularly opportune timing however, as several other British manufacturers, also with hungry eyes on the moped market, appeared at the same event with their own offerings. Striking and original engineering creations from Hercules with the Grey Wolf, and Mercury's Mercette would obviously draw the limelight (but not many customers it seemed), while Norman debuted the brilliantly named Nippy, and Bown their less well chosen Bambi 50 (the Bambi title was very quickly dropped). The UK competition and continental importers seemed more successful in the scramble to grab free show publicity, and Phillips subsequently found their new machine with barely a mention in the press. In October 1956 an elegant 10-pint 'teardrop' tank replaced the original 7-pint 'bubble'. 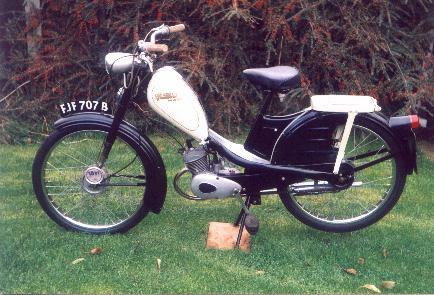 Then as the Villiers 3K 2-gear moped engine started to reach the market by July 1959, this succeeded the German motor, and resulted in the model P45. It wasn't all over for the Rex installation however as a new 3-gear unit became available and offered the opportunity for Phillips to add a new flagship to their range, designated the P50 Deluxe 3. Initially these were painted in the same Royal Carmine Red that characterised both Norman and Phillips machines of the time, but this colour was quickly superseded by a classy paint job in black and ivory with gold lining to set it visually apart from the basic model. The new motor wasn't simply a 3-speed version of the old 2-gear unit, but featured new, smooth crankcases devoid of the radial finning on the earlier castings. The clutch cover was also restyled to iron out some of the lumpy bits, and resulted in a width increase of about 11/2". 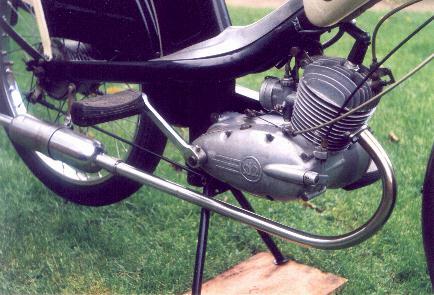 The other working parts, crank, clutch, piston, steel lined aluminium barrel and cylinder head remained common, but a Bing unit replaced the Pallas carburettor. Power output was still rated at 2.1bhp @ 6,000rpm, but became much more usable as a result of the spacing from the extra gear, and benefited slightly from the 4% top ratio increase from 14.9 to 13.5:1. Visually the engine exuded quality and looked a real credit to its designer. Phillips always remained traditional in staying faithful to their own rigid frame, while judging by their construction, the Gadabout inverted telescopic forks are most unorthodox and must have been the product of a former steam engineer. Outwardly they appear conventional enough, but above the tubular bottom sections, the legs become hexagonal in form and run in cast bronze top bushes broached through to a matching hexagonal bore! The top greasing points screw through the legs directly into the bushes to inject lubricant straight into the upper working part. The lack of seals to the sliding leg suggests the designer expected the proud Gadabout owner to always be diligent with lubrication schedules to preclude dirt entry-now back to planet Earth after that brief flirtation with unreality! Every Gadabout I've ever seen has completely worn out bottom bushes, which fortunately are round (unlike the top set), and can easily be remade. It's something of a relief that the contaminated grease never travels up far enough to erode the top bushes, since machining out six-sided holes could present quite a complication. Another puzzle is how to adjust the saddle height? Search the frame all you like, in the toolbox, under the frame, but there are just no clamps anywhere to fix the stem-it's as if it's held up by magic! The conjurer's secret is only exposed by removing the seat. I can't recall a handlebar stem adjuster used on a seat stem on anything else I've ever seen before, but it seems to work fine, and the frame looks so much cleaner without the traditional stem clamp. Attention to detail you see! The British Hub Co brakes are operated by back pedal to the rear, which gives excellent performance and can easily be made to lock up the wheel under excessive pressure. The twist change situated on the left bar features a most unconventional addition-pre-select gears! Properly set up, this precisely locates the gear before you've let out the clutch, to provide a perfect crunch-free shift. This appreciably contributes to the operational impression of quality, but this mechanism will also automatically block the rider shifting beyond one position at a time, and physically prevent you going from 3rd straight to neutral or through into 1st. This situation is overcome by an additional thumb operated override lever under the twist-grip, but its operation never really comes naturally and you are only reminded to use it after first finding yourself battling against the change. Now with all the controls sorted out, would sir care to take our latest model for a ride? Thank you Mr Phillips; don't mind if I do! The decompressor trigger gets the motor spinning much more easily than similar machines without such a considerate facility, and the trigger choke readily fires up the engine without the need to reach down and fiddle with nasty petroily bits-all very civilised. A couple more flicks on the choke and the motor very quickly settles down to a steady tick-over beat, so the whole outfit feels really good before you've even pulled off! Getting away reveals a nice clutch with clean shifts and a steady urge right up through the gears on ideally spaced ratios. The bike is light and nimble, but reminds you its conservative design isn't intended to be scratched around corners by fairly readily scraping the centre stand, though this does establish the handling as sure footed up to its intended limit. The exhaust note gives a pleasantly powerful and regular beat broken by a loud induction draw under throttle through the unducted filter on the back of the carb. Despite the confident impression of power this may give, in this case it can become a little tiring on longer runs since this is actually not a sports machine. The P50 is consistently strong throughout its range but was never intended to work at revs, and is most comfortable cruising steadily. The VDO speedo tops out between 35 & 40mph according to best conditions, but it's so pleasant in top gear around 25mph that you generally settle down around this natural speed. The Phillips Gadabout Deluxe 3 is simply a superb quality ride, not fast, but it doesn't need to be-it's got class. The Gentleman's Club of old mopeds! The Raleigh Group's decision to factor branded Motobécane products for the 1962 season meant that the P50 was actually produced for barely two years-it deserved much more! If circumstances could have been different and the Gadabout naturally developed with rear suspension, it may well have gone on for a long time as a fine machine. Sadly the Phillips brand name became another casualty of group rationalisation, and had disappeared from the manufacturer's lists by 1964. All the Phillips Gadabouts are really nice quality British brand machines, inexplicably unappreciated and ridiculously undervalued. The P50 was surely the finest of these, however it wasn't the last Gadabout. That honour went to a completely different factored machine that wore the Phillips logo for the final time. Labelled under various badges and in several forms, this machine went on to become developed over nearly 20 years of continuous production and surely rank as one of the greatest mopeds of all time-but the Gadabout Mk IV model PM2 is the start of another story!